One time when I was getting a job interview for an entry level position, my potential employer took a good look over my resume. “So I see you’re really into this anime stuff,” he said. Since I had run a number of anime clubs in college and minored in Japanese, it was a pretty obvious theme through out my resume. I am a little worried about bringing up this subject at job interviews. How would these potential employers interpret my hobby? Would they consider it unique and interesting, or would they think it was silly and childish? But luckily for me, he seemed to have a very favorable impression on the medium. And a week later, he hired me for the job. So when No Starch Press sent me over their current selection of The Manga Guide to… educational series, I remembered what my boss had said about learning his trade from just one comic book. Can manga actually be used in education? After reading through three books that have been released in the series, I can confidently say that yes, manga does make a great educational tool. 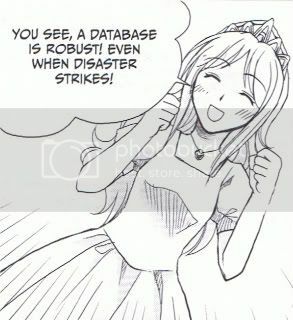 I selected to read The Manga Guide to Databases first because it’s related to my profession in IT. While I don’t necessarily deal with databases every day, I have used them quite a bit. In fact, my Anime Almanac the Live website completely runs off of a MySQL database on my own server. With this volume, I was introduced to the basic structure of these guide books. Each book contains its own complete story of a person in need of tutoring on a particular college-level subject. 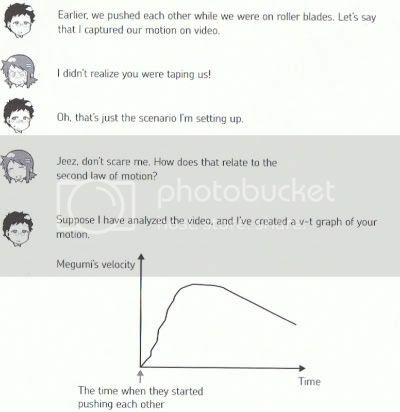 After each chapter of comical interaction between the tutor and the student, there are several pages of text that review all the points brought up by the characters in the comic. These review sections also include more details, charts, and on occasion, a few review questions for the reader. The story for Databases revolves around a princess and her kingdom’s exporting sector. Her manager is going nuts because the kingdom’s economical information is disorganized and misinformation threatens chaos among the lands. 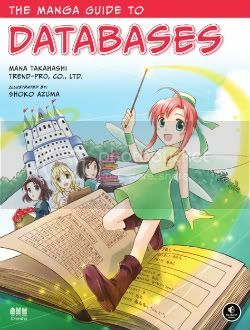 In comes Tico, a magical fairy who teaches the two how to use a database to keep their information organized and their kingdom stable. Yes, it is a cutesy narrative fairy tale about a modern and mundane subject like databases, but it worked and was actually quite enjoyable. Did it teach me anything? Well, no, I already knew everything they had to say. And in fact, I’m a little doubtful if their “designing databases” chapter is really all that useful as I consider design to be more of a skill and not so much a thing you can learn from a book. But still, I found that all the information they presented in this comic was identical to the information I had read in my Databases textbook back in college. However, I enjoyed reading it much more in this narrative comic book format then I did reading it in that textbook. To get a different perspective on the educational potential of this series, I selected to read The Manga Guide to Physics. This was a class I was required to take in college and high school, but for the most part, I haven’t dealt with the subject since then. I immediately realize that no two manga guides are the same as each one is drawn by a different artist. For Physics, we follow the story of a high school tennis player who struggles with her physics class and her game. She gets tutored by the class egghead on physics, and the information ends up helping the girl to prepare for a rematch tennis bout with her school rival. This volume added a good text-only section in which the two main characters bantered between each other about some of the finer points of physics. These dialogs proved to be more effective in teaching the reader the subject than the comics did, while still remaining charming and amusing. The story and art style gives off a vibe like a normal shonen romance series, and I think that if there is a problem with this particular volume, it would be this. While Databases was cutesy and fanciful, it seemed very accessible to most college students that might need to learn the subject. After all, we all grew up on fairy tales. 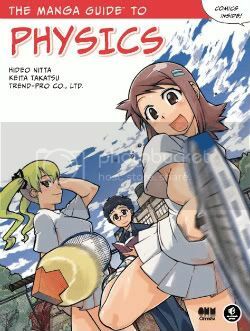 However, being deep in Japanese high school culture, and diving into some of the slightly perverted nature of this genre of comic, I’m afraid that Physics might be a little too unusual for students not already familiar with manga. Since these books are printed in the “flipped” format of left-to-right, I assume they are trying to target an audience beyond otaku. But still, it was more enjoyable as a comic than reading a physics textbook. While I don’t really think I learned anything new, it refreshed me on a lot of the concepts and theories I learned back in school. 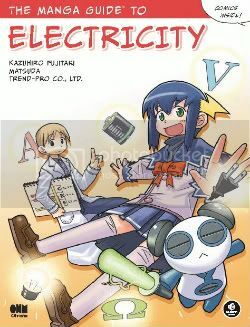 And finally, I selected to read The Manga Guide to Electricity because I do not know anything about electricity beyond its daily household uses. What would manga be like teaching someone a brand new subject? This volume shows the story of a girl from an advance planet in outer space. Unfortunately, she is unable to keep up with the advance teachings of electricity. So for help, her teacher sends her down to the “simple” planet Earth to take some remedial courses on the basics. And it was with Electricity where I finally discovered the power of this series. 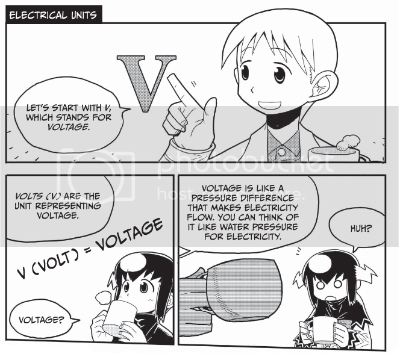 Again, I knew nothing about electricity prior to reading this comic. But thanks to the simplistic dialogue of manga and the pacing of the story, I very easily took in every single bit of information that this book was trying to convey. By the end of the first few chapters, I had a very good understanding on voltage, circuits, and how electricity is formed at the atomic level. I even learned the differences between AC and DC power, and why being electrocuted by one type would feel different from being electrocuted by the other. It was all so fascinating, and I wanted to read more and learn more from this book. If only I found regular textbooks to be this effective back in school, then maybe I might have been more motivated in my studies.. It makes me wish I was a college professor just so I could assign these books as “required reading” to my students. The Good: Adding a narrative in the form of manga to textbook concepts and theories takes away the boredom and dullness of higher education. This makes it easier to pick up on new information. The Bad: Since they do originate from Japan, some of the stories might be too “otaku” for the average American student. Final Verdict: The Manga Guide to… educational series is a fantastic and fun way to learn very deep and important material. I can strongly recommend it to any student taking the courses offered in the series, or to anybody just wishing to learn about a brand new subject. This entry was posted on Thursday, June 4th, 2009 at 8:05 pm by Scott	.